'Colourful' is supposed to be the motto of the Swedish brand HAPPY SOCKS, but they can do more. 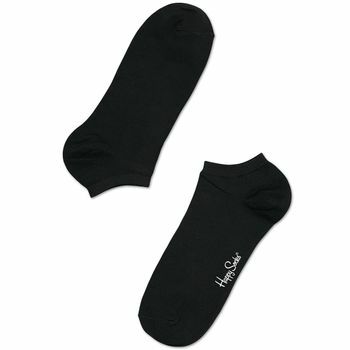 These basic low socks are made from the best combed cotton and have a super-comfortable fit. With their reinforced, hand-stitched heels and toes reducing wear and ensuring a long hard-working life, HAPPY SOCKS ooze quality, offering a wide range of models in all sorts of crazy designs. Special feature: hand-stitched toes & heels – a must have! Happy Socks was founded during a typical Swedish spring in the year 2008. The vision was to transform an everyday object into a colorful design piece, to spread happiness and to provide an uncompromising standard of quality, craftsmanship and creativity; this is a concept perfected by the Happy Socks founder, and started in a 400-year-old, bright red cabin in the midst of cherry trees in a park in central Stockholm. Today Happy Socks are available in over 40 countries, selling across all continents. The selection of socks contains an almost endless variety of styles and designs with a wide range of colour combinations, materials and textures. Simply said, a pair of high-quality socks for every occasion, every mindset and every style. Happy socks are made with the precision of Italian Lonati machines in a local factory in Turkey.